The retaining wall on the Station-Swanson Path looked like this on Jan. 9. The latest example: The path from Albany Station under the Pacific Boulevard viaduct to Swanson Park. This winter, the place once again looks like a mess despite repeated efforts over the years to clean it up. 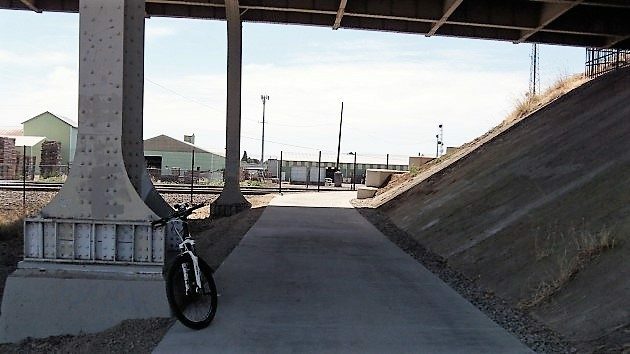 The 600-foot-long footpath and bikeway under the overpass was part of the design of the rehabilitation of Albany Station, the 1909 railroad depot on which the city, the state, the federal government and AMTRAK spent about $11.3 million in 2004 and 2005. Building the path was delayed for a few years. But in 2015, a contractor for ODOT completed the concrete pathway for $383,692 . Part of the expense was in the retaining wall, made necessary because the path cuts into the bank that holds up the highway. Now that wall has proved a tempting canvas for jerks with spray cans. 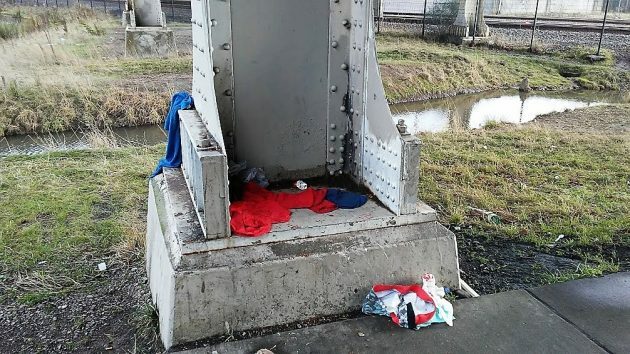 The rest of the path and the surrounding area are usually strewn with garbage, and under the overpass itself you can see the remnants of vagrant camps. Look how clean the path was when it was new in 2015. If you find them Mr. Hering I’ll hold them and you can break their fingers. Not very caring people. Thanks for posting. 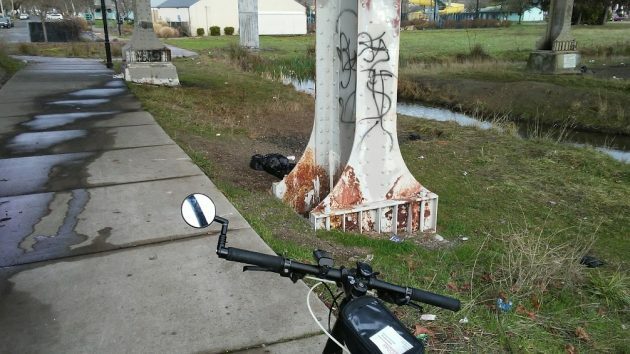 No reason to get all huffy about taggers and vagrants. It is difficult to condemn these artists. 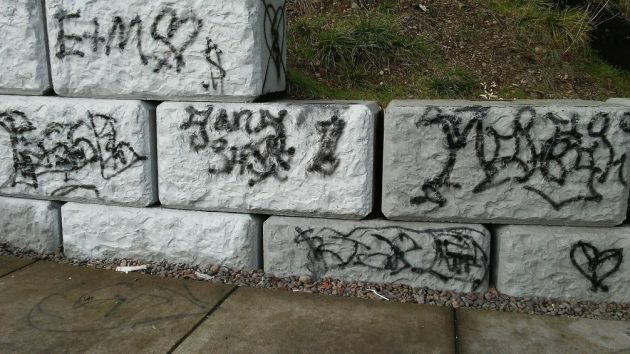 Let’s save our outrage for drunk, rich kids who vandalize university buildings. And crimes against property shouldn’t bother you so much. No one gets hurt. Save your anger for residents who light up a cigarette outside an entrance to city hall or at the Carousel. Graffiti is a mere nuisance, an visible reminder of the underclass trying to have a voice in a society that oppresses them. Take a chill pill and to see things from a more progressive point of view. Gordon: Are you being satirical? I am guessing so, but in today’s world this could pass as a reasonable statement. I’m “Feeling the Bern”, I think. Well Mr. Shadle, I don’t know how long you have lived in Albany or if you have lived in bigger cities where this is a common occurrence, but I have and I can tell you that the only hing is does to a town or city is make it look like a slum. This area is one that is seen by everyone that drives through Albany and it’s sad to think this will be how people will judge us. If the city could work with the graffiti artists maybe an area could be provided for them to paint. The trash and other garbage is gross and disgusting. Perhaps a decent garbage disposal would encourage those who just throw there trash on the ground to use it. I don’t pretend to have the answers I just hope that some of our city fathers might. So much money has been spent in Albany to welcome new comers to our city I would so hate to see everything go to ruin. I love Albany as my children do. I want to see a lovely town and safe town for us all to live in. Shadle was pulling my leg. I think. I never understood the impetus of building this path in the first place. Who really thought there would be demand among train passengers to take a break from their journeys to take in dip in the Cool pool? Or that the neighborhood adjacent to the Cool pool was so full of regular train passengers that the path seemed justified. It appears to me that someone applied for a grant, had it approved (clearly by some entity that has no real sense of the reasonable need) and, Bob’s your uncle, we got a shiny new trash receptacle and graffiti canvas. Lucky us! Good thing is was paid for with “free” money. Your timeline and how the expenditure came about is right on! They were able to get some taxpayer money, so they got it, and built a walk-way for the homeless people. The homeless have to exist somewhere. I would have to agree here. A good majority of houses around the pool are knowen for heavy drug use and the underpass has always been a bum camp. I think it was a case of “Where can we waste money while taking attention off real issues”. And I don’t remember voting for it, but that doesn’t mean anything with our wack city government. If that’s the way you feel, invite these criminal taggers to come and tag your whole house and car. It’s a small price to pay, right?